Hidden away in the West End of Aberdeen is Rubislaw Tennis Club, an outdoor club offering 3 floodlit artificial clay courts for its members. 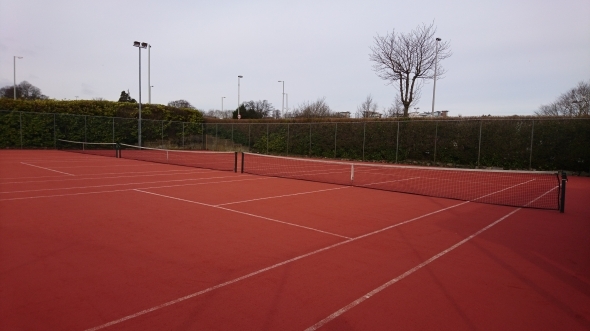 These new artificial clay courts were laid at the end of 2017 and are the first of their kind in the North East of Scotland.The club has a long standing reputation as one of the best clubs in Aberdeen, not only for its calibre of players but also for the support and encouragement given to all its members and its promotion of tennis within the North East. Whether you view tennis as a social hobby, a serious sport or a family affair Rubislaw provides a year round programme that incorporates all groups and integrates them into the Rubislaw club through competitions, coaching, development programmes and social events. So, if you are thinking about rekindling your love of tennis, are already a keen player, have Wimbledon in your sights or are a complete beginner then have a look around our website and see what our club can offer you. If you want a friendly and supportive environment with excellent sportsmanship then look no further - you`ve found it right here! Rubislaw has become the first club in the North East of Scotland to have Artificial Clay installed as the playing surface. The courts were laid in October 2017 and have already proved a hit with members. The slower, higher bouncing surface enables players of all abilities to perfect their technique and learn how to construct points. The surface can be used all year round and the ball even leaves a mark on the court, so there can be no more disputed line calls. Some members have found this more useful than others! Check out our list of previous Men's and Ladies Singles Champions. The list goes right back 1926!! How many do you remember? Members can now book courts using the ClubSpark Booking System either online or via an Android or Apple App on their mobile device. New members will be automatically sent an invite to join ClubSpark within 14 days of receiving their membership confirmation. Click on the link below to be taken to the court booking webpage. Tennis Scotland have teamed up with kit-house to produce official Aegon Team Tennis clothing. Rubislaw hoodies, t-shirts and ladies tops along with junior clothing can be purchased using the link below. Please ask for Rubislaw to be printed on the back when ordering. Rubislaw has a vibrant social scene and runs a number of events throughout the year. Events are publicised by email and the notice board in the cubhouse so keep an eye out for the next event. The adult sessions are listed below. All sessions are open to members and non-members. A fun session open to members and non-members of all abilities. Come along and join in and see if they can last the hour! With lots of running and drills this session is guaranteed to work up a sweat. Open to Green/Junior members. Supervised Fun Games, Matchplay, Table Tennis, Pool, Airhocket, Table Football, Archery, Boules, Darts and Tuckshop. £2 per session, no booking required just turn up. Darren will be running fun sessions throughout the Easter, Summer and October holidays.